This sophisticated dessert takes little time to prepare but it tastes like you've spent hours slaving away in the kitchen. If you don't have a fresh cinnamon stick, use a teaspoon of ground cinnamon instead. Place the honey, cinnamon stick and water into a small saucepan, bring to the boil and then reduce the heat and simmer for five minutes or until reduced by half. Discard the cinnamon stick from the syrup and stir in the almonds. Preheat the gill to medium-high. Slice a deep cross into each fig, making sure that they still stay attached at the bottom. 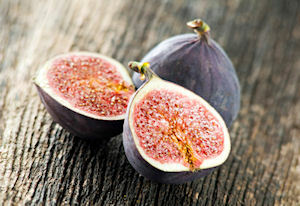 Combine the ricotta, vanilla, icing sugar and orange zest in a bowl and divide between the figs. Spoon the syrup over the top. Bake under the grill for around five minutes or until the almonds in the filling have toasted. Allow to cool for a few minutes before serving. You could easily serve these figs as part of an Italian dessert platter - arrange them on a board with some dark chocolate, frozen grapes, soft goat's cheese, bruschetta and some grappa or limoncello as a delicious way to end your meal. This recipe serves four people.